Jonathan Kent once taught Clark a life lesson on using his intelligence and skills over brawn. This tough love taught the cocky boy a valuable lesson, one that stayed with him forever and he utilized every day of his life since. After the events of Manchester Black's manipulations, young Jon was feeling lost, using his might to 'fight for right' and the super-powered boy is making bigger and bigger mistakes. Clark feels the pressure and confides in Lois that he feels Jon is losing his way but a heart to heart leads to Clark offering Jon the chance to be Superman for the day and what follows isn't quite what Superman envisaged. As Dreadnought and Psi-Phon reveal they are the attackers on Metropolis, Superman and son forge bonds anew as family and as superheroes. Jon might not be ready to be Superman but at least he has learnt that 'fools rush in' is apt and one day he'll be ready, but until then he is Superboy and a super son. Story - 5: This is definitely one for the reader or fan that has harped on about Superman being all about his powers, brawn and strength and much less about his intelligence. Fanning the flames of that stereotype, DC & Marvel once pit him against Hulk, the very embodiment of that. Moreci finally buries that by showing us that there is more to Clark Kent. 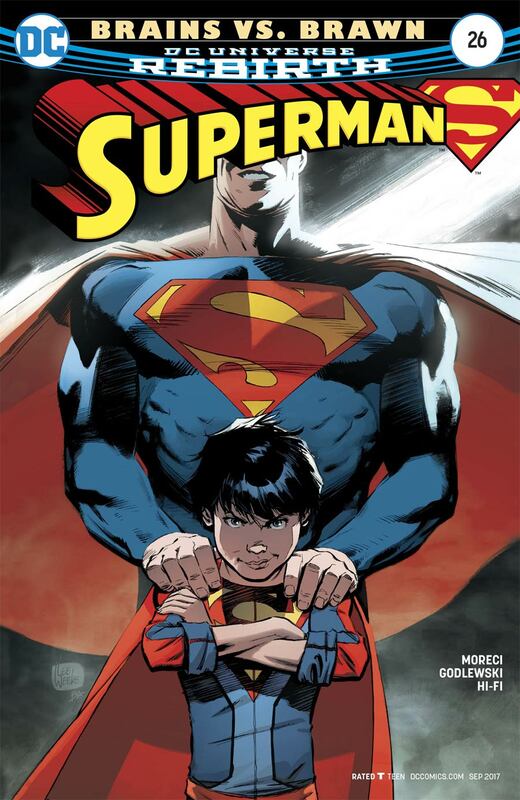 A great follow up to the recent corruption of Superboy and a wonderfully nostalgic glimpse into Clark's past. Seeing Martha and Jonathan and how they made Superman into the man he is today is always a nice touch. It also served a great purpose, bookending a long term storyline and showed they are still relevant, even to a headstrong half Kryptonian. Art - 4: The art has the frenetic and energetic feel that Trinity sports, with a similar color palette. Where the art recently has flipped between bold and almost anime to gritty and atmospheric, this issue delivers a feeling of freshness, of a boldness that definitely serves to elevate the story. The art was a welcome change of pace and Godlewski does a stellar job of changing the book's direction. Cover Art - 3: Considering the arc that just ended, this cover takes on an entirely different feel to what I think Weeks had intended. However, if he was going for corrupt and dark then he achieved that, it just felt a little on the nose; similar in style and thematics to the ones featuring Jon on the cover for the past few issues. Jon isn't Damian Thorne, he's not Damian Wayne either... he's the son of Superman himself. 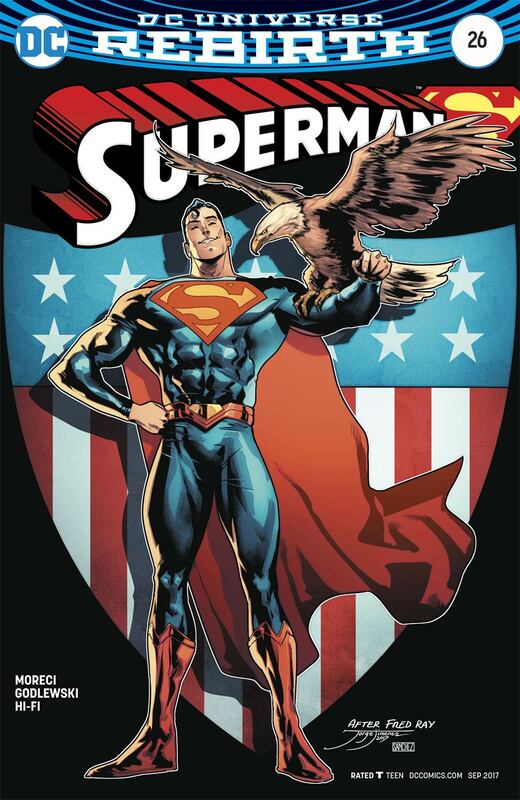 Variant Cover Art - 5: One of the most iconic of Superman images, topical I suppose with its release coinciding with Independence Day. Jorge Jimenez your cover inspires me and I'm sure delivers a definitely welcome emotional response and sense of hope & pride. Creative enough to be 'new' and just familiar enough to feel 'classic'.